Hello friends! Hope you all had a fantastic weekend. Del and I had a busy one hanging out with our Grandkids and spending some time outside. I love spring! The weather was beautiful here. I even have daffodils and tulips coming up in the yard. Several days ago I had a chance to play with a friend and we decided to make the February Tag. 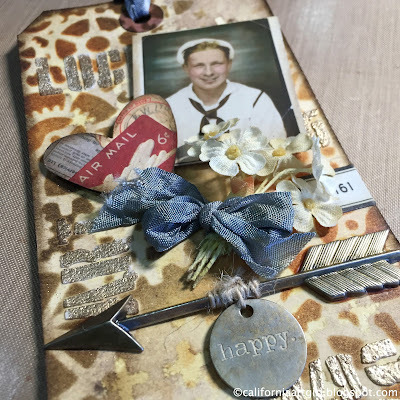 Love that Tim Holtz is doing the Technique Remix and revisiting some of the great techniques from past post. 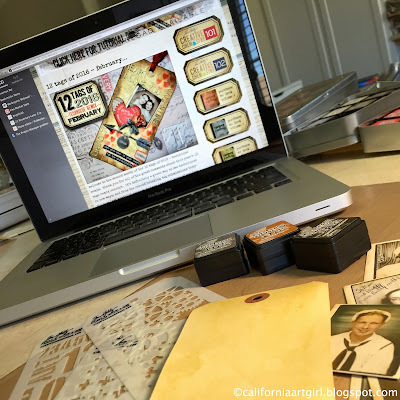 I always start with a quick look at the blog post for the tag. The instructions are awesome with step by step photos that are super easy to understand and follow. Then I gathered up some supplies and we were off and running (creating). 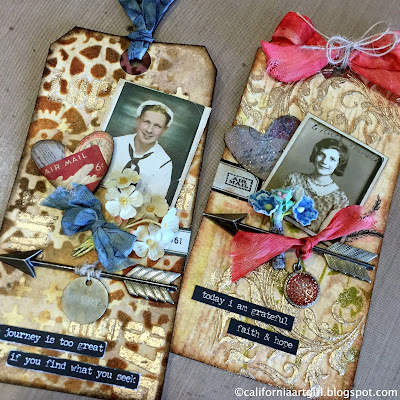 Here are the tags Wanda and I made. 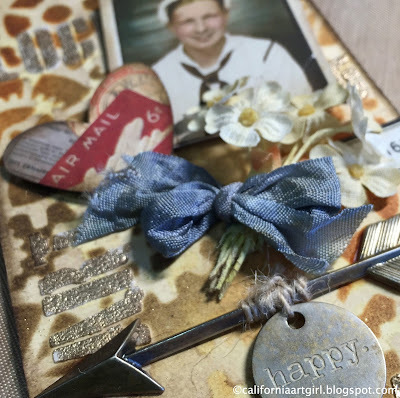 It's always more FUN to craft with a friend! I really loved the mono printing and the gold embossing techniques for the background. 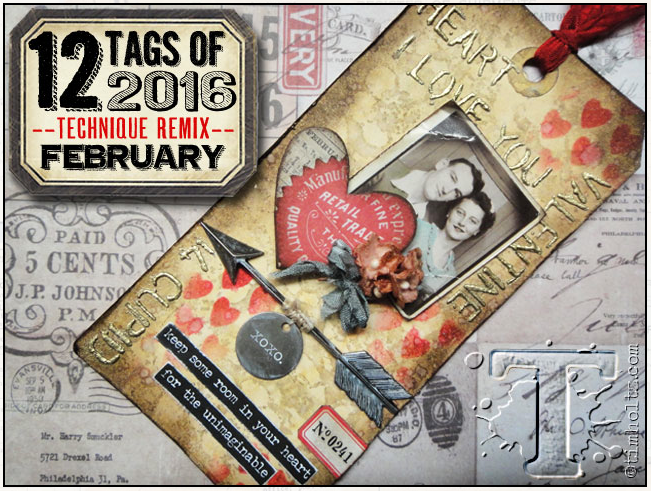 I hope you will join in and create your own version of the February Tag of 2016! You know there is prizes involved if you win! Just upload your tag on to Tim's blog before the end of February. 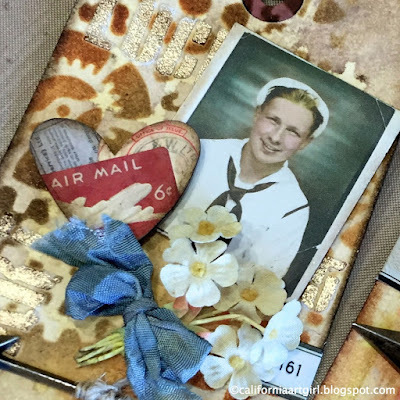 Here's the link to get over to Tim's post! Thanks for stopping by and I hope you have an AWESOME week! Organizing with the Supply Spinner and Distress Marker Tin! 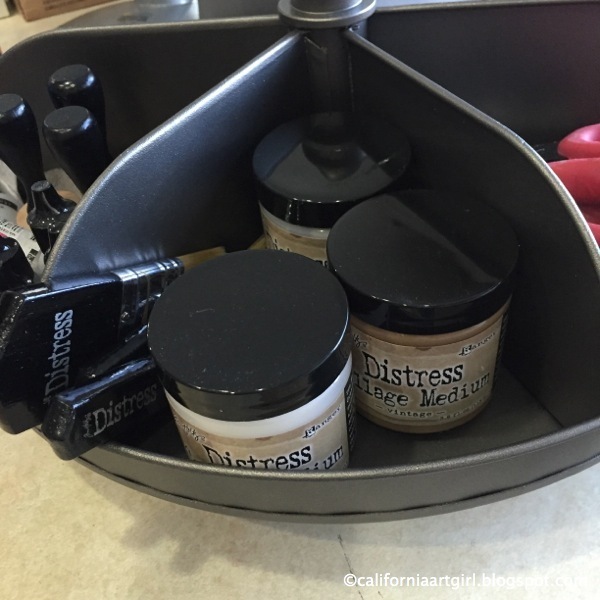 Anyway I posted some photos on Instagram earlier today showing the new Tim Holtz Supply Spinner and Distress Marker Tin. Lots of likes so I thought maybe I should show you a little more about the new storage and how I stay organized. The Supply Spinner measures about 14" across and 7" high. I put the supplies in it that I use all the time. It's nice to have them handy. The Spinner has 6 bins and they are open on the side for easy access. 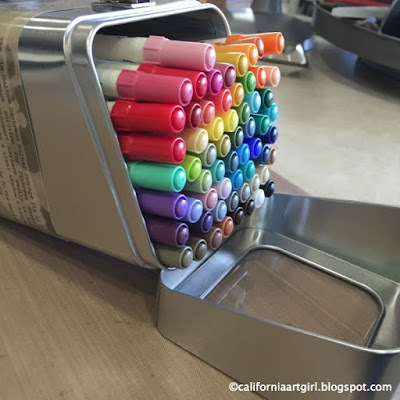 It will hold the NEW Distress Crayons! 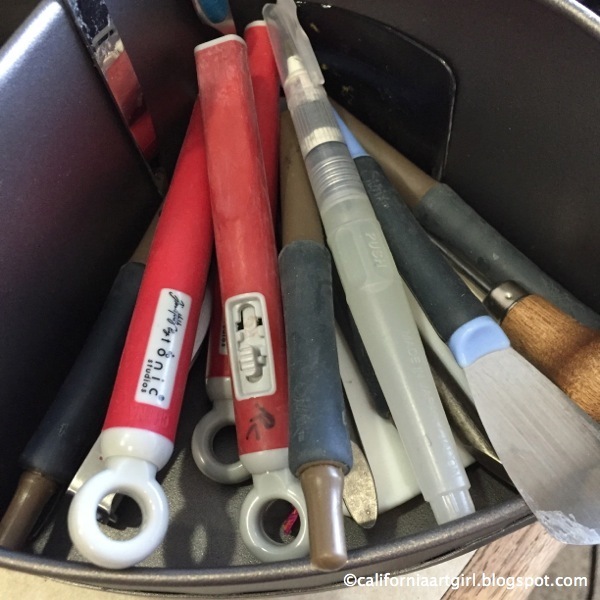 Tubs of different Collage Mediums. Alcohol inks, blending tools and adhesive in little bottles. 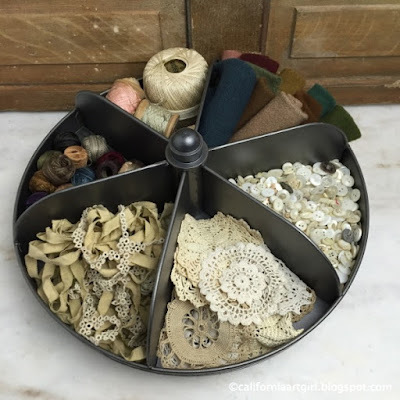 Here is another idea for the Supply Spinner.Because I like to sew I've added some of my favorite sewing treasures. You get the idea….it's very versatile. 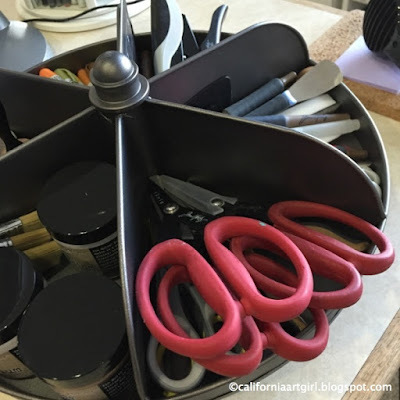 I think my husband would love one in the garage, or maybe even one in the kitchen. I wish I had taken a before picture…to late now! 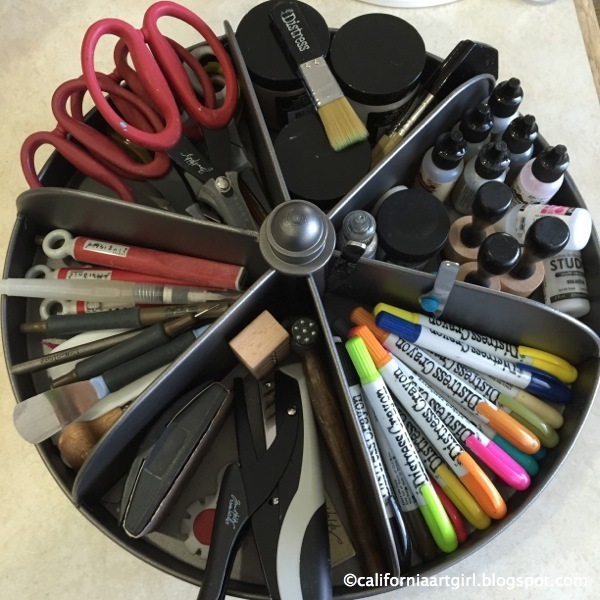 Before I had a plastic silverware caddy to hold my tools and sometimes I found it was hard to find what I needed. 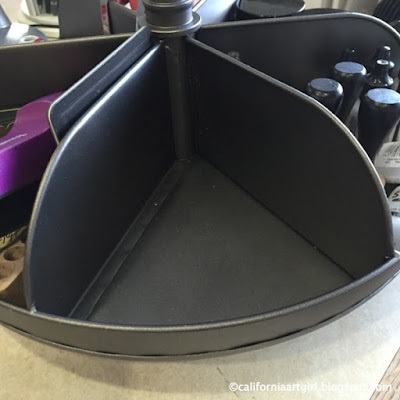 I think the open bin concept is going to be great...I'll be able to easily dig around for what I want. I like the fact that it doesn't take up too much space on my table and it spins easily so you can reach everything just by turning it. You can lay the Tin on it's side and it rests on the lid. 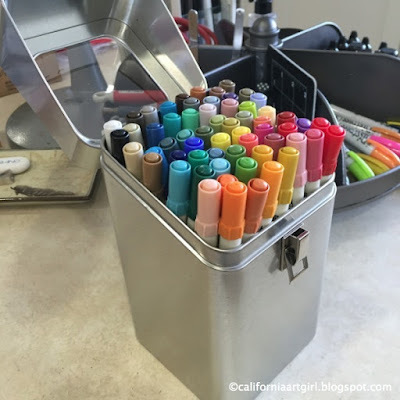 Makes it easy access to the markers. 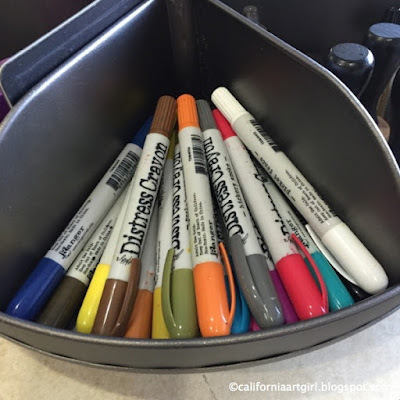 Don't forget to always store your Distress Markers on the side! It's not good for them to stand on end. 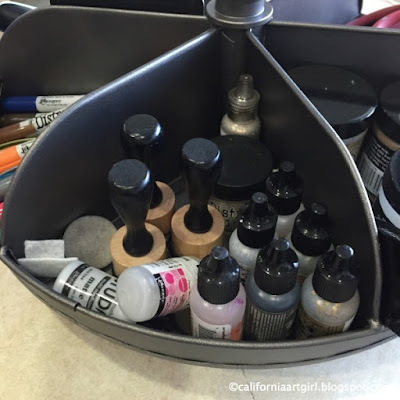 I will be back later with the Tim Holtz Storage Cart when I get it all set up! 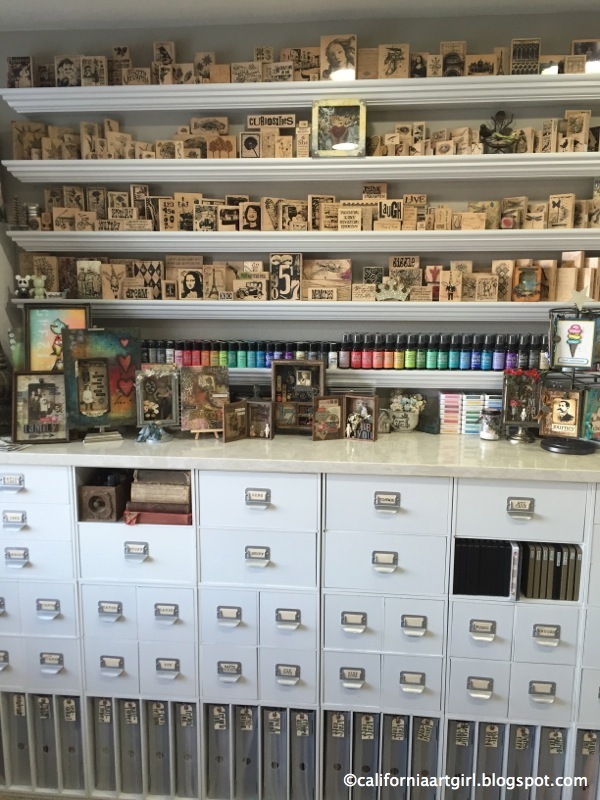 You're in luck some items are already in stock at Simon Says Stamp! Yahoo! !